This article will help you to become a better, more consistent ball striker. You will learn how the correct ball position will enable you to achieve clean, solid contact every time, avoiding the fat or thin shots that plague most golfers. Is Ball Position Dependant on Club Selection? Much conventional golf wisdom says that your ball position should change for every club in the bag. It should be back in your stance for your wedges, and moved progressively further forwards for your mid irons, long irons, hybrids and fairway woods. Once again, conventional wisdom is wrong. Do you really want to have 13 different swings, one for each club? Changing the ball position changes the timing of your swing and the way that your body needs to move in order to strike the ball properly. It is true that we want a steeper angle of attack with the shorter clubs, but this is achieved because we hit the ball at the same point before the bottom of the swing arc with every club. A shorter club means a smaller radius, and thus a steeper angle of attack. We’ll discuss this more in later articles. In the Swing like a Champion System, ball position is constant. It is based on science. It is based on anatomy and on the physics and the biomechanics of where the optimum impact position should be. Your body doesn’t change depending on the club you’re using. And it’s obvious that we’d like to have just one full swing for all standard shots — the game is difficult enough as it is, without having to change your swing all the time! Why is Ball Position So Important? Our goal is to strike the ball cleanly, accurately, powerfully and consistently. To do this we must strike the ball before the ground, striking down on the ball with a forward-leaning shaft, hitting the ball with the sweet spot on the club face, and striking through to take a divot after the ball. And yes, you should take a divot in the same place after the ball with every full swing shot played off the ground, with every club. Your divot with a 3-wood will be a lot shallower than with a pitching wedge because of the wider swing arc and the resulting shallow angle of attack, and because of the design of the sole of the club. In fact you may only scuff the turf rather than dig into it, but you still strike down on the ball and you still take a divot in the same place. Figure 1. Striking down on the golf ball, taking a divot after the ball. What is the Perfect Golf Ball Position? The perfect golf ball position for every full swing shot is with the back of the golf ball two golf ball diameters inside your left heel. 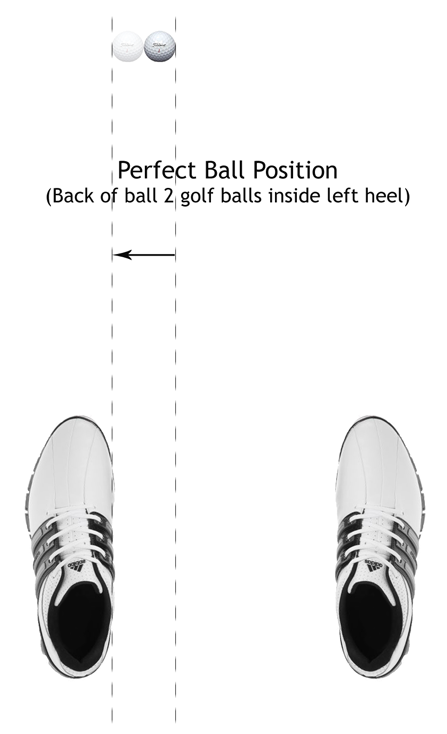 This assumes you have the perfect stance width, as described in Golf Swing 102a – Setup: The Perfect Golf Stance Width. For most golfers, this will place the back of the ball level with your left ear. As we’ll see in the drills, it is better to use the left ear as a final reference point, rather than the heel, because it is consistent, whereas the heel position may vary slightly due to uneven ground or slight errors in your setup. This position is the same for every standard full swing shot played off the ground. When you tee the ball up, use the same ball position. Tee it low, at most ¼” (0.5cm), and take a divot in the same place as when played off the ground. For speciality shots, such as driving and shot-shaping, you will make small adjustments. These will be described in later articles. Why is this Ball Position Perfect? Perfect stance width is about generating power (club head speed) efficiently, consistently and safely. Perfect ball position is about optimal delivery of that power to the ball — putting the ball in a position where it “gets in the way” of your swing at a point where you will achieve the best possible results. This is key to a good golf swing, and something that most golfers never properly appreciate — the golf ball is never the focus of your swing, it simply gets in the way of a good swing. As we explained in Golf Swing 102a – Setup: The Perfect Golf Stance Width, in the Swing like a Champion System you will learn to move in such a way as to achieve the same impact alignment with every full swing. We described how this alignment was a direct result of moving your body efficiently, consistently and safely in order to generate maximum club head speed. This alignment puts the bottom of your swing arc directly under the centre of your left shoulder, and your shoulder will be over your left foot. You will strike the ground in the same place every time, with every club. You will generate maximum club head speed in the same place every time, with every club. A great swing will result in a divot that bottoms out 3 golf balls (4 to 5 inches, 12cm) ahead of the ball. It will be shallow (deeper with shorter clubs, but not the size of a small badger!) and about the size of a dollar bill (4 golf balls / 6 inches / 15cm, long — slightly longer than a 5 pound note or a 5 euro note). For perfect ball striking, the best ball position is just before where the club strikes the ground and the divot begins. This results in striking the ball before the ground, striking down on the ball with a forward-leaning shaft, hitting the ball with the sweet spot on the club face, and striking through the ball. 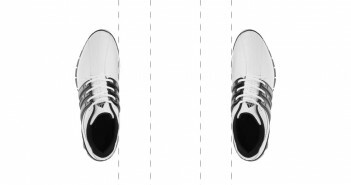 With the Swing like a Champion System, you will learn to move in such a way as to consistently take a perfect divot, 4 golf balls long, that is centred level with the centre of your left ankle. Your divot will, therefore, begin 2 golf balls inside of the centre of your ankle, or about 1 golf ball inside your left heel. The perfect ball position is before the start of your divot, or 2 golf balls inside your left heel. Strike the ball cleanly, before striking the ground. Strike the ball with the middle of the club face, the sweet spot. Strike down and through, taking a divot that bottoms out 3 golf balls (4 to 5 inches, 12cm) ahead of the ball. Are moving your body in the most efficient, most consistent and safest way possible. Strike the ball at the point where the club head has maximum stability and is moving at maximum speed. Have plenty of forgiveness; the bottom of your swing arc can move back or forward, and the depth of your divot can vary considerably, and you’ll still strike the ball well. Your bad swings will have good results. Thus, with one consistent swing pattern and this fixed ball position you can strike the ball perfectly, every time, with every club. We’ve worked with thousands of golfers, at all levels of the game. We know from experience that if we see a golfer who doesn’t usually take a divot, then the bottom of their swing arc is probably about 4 inches before the ball, but erratic, and they do actually strike the ground slightly, as often as not, well before the ball, costing them power and consistency. They are a high handicap golfer. Show us a player who takes a fairly consistent divot, about 2 to 4 inches (5 to 10cm) after the ball, and we’ll show you a single-figure handicapper. A golfer who consistently takes a shallow divot, that bottoms out 5 or 6 inches (15cm) after the golf ball, is an elite golfer, probably making a good living on Tour. This is a gross generalisation, and there’s a lot more to playing good golf than being a great ball striker, but it holds true a lot more often than not. Driving the ball is a speciality shot that will be discussed in detail in later articles, but ball position with the driver is worth discussing briefly here in order to help you understand ball position in general. With the driver, you may have slightly different goals than with a standard full swing shot off the ground. If you want to hit the ball very accurately, then the standard ball position described in this article, together with the perfect stance width as described in Golf Swing 102a – Setup: The Perfect Golf Stance Width, are ideal. But, with the driver, the chances are that you want to hit the ball as far as possible, and you’re willing to compromise on accuracy in order to gain distance. In order to hit the ball a long way with the driver, you need a higher launch and less spin. For most golfers, this means hitting the ball with a slightly positive angle of attack (hitting the ball after the bottom of the club’s swing arc), and making contact on or slightly above the sweet spot on the club face. 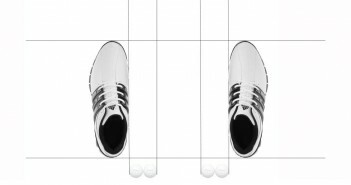 So, when maximum distance counts with the driver, tee the ball a little higher, widen your stance slightly and place the ball level with your left heel. Note that if you have a very high swing speed (115mph+), which the Swing like a Champion System will help many golfers achieve, then a more level or even slightly negative angle of attack may be preferable for optimum launch — the distance gains from a higher launch become progressively less, to the point where they are no longer worth the loss in accuracy, it’s a law of diminishing returns. This isn’t relevant unless you carry the ball over 280 yards (255m) with your driver. With a 3-wood off the tee, we recommend using the standard ball position and stance width, and teeing the ball up about ¼” (0.5cm). You can find out more about this in Golf Swing 109 – Setup: How to Set Up for the Driver in the Golf Swing. Having the ball just slightly out of place will affect your whole swing, not just the moment of impact. Improper ball position will change the way that you setup to the ball. Correct setup is vital for making a good golf swing, and the most important thing of all is that it is consistent — it is the one part of the golf swing that, with the right tuition and a little practice, you can get right 100% of the time. Most amateur golfers place the ball too far back in their stance; most often in the centre, in front of their sternum. This is because most golfers, through poor swing mechanics, hit the ball fat regularly, or they hit the ball too high, so they move the ball back in their stance as a quick fix. If the ball is too far back in your stance then you won’t have enough spine tilt away from the target (see later articles), and you won’t setup with your head behind the ball. Having your head behind the ball throughout is essential for a good golf swing. If you start with your head in the wrong place at setup, relative to the ball, then you’ll need to compensate for this later in the swing. Lack of secondary axis tilt, as we’ll see in later articles, will cause you to change the path and plane of your swing, you’ll be in the wrong position at the top of the swing and moving incorrectly into the downswing, destroying your timing and sequencing. If you’re a great athlete you might be able to compensate and rescue the swing, but you’ll never do that consistently. If the ball is too far back in your stance this will also inhibit your weight shift, causing inconsistency and loss of power. You will subconsciously sense when the ball is out of position. Your subconscious self (The Player) will know that if you transfer your weight properly then you won’t strike the ball cleanly. If you swing properly into the correct impact position, then you’ll hit it thin, top it, or miss it entirely! So your subconscious will automatically introduce numerous compensations throughout the swing, resulting in inconsistent ball striking. It’s a vicious circle that you can’t avoid, everything in the golf swing is moving too fast. Most golfers compensate for this inability to transfer their weight properly by letting their arms and hands take over the golf swing, often resulting in a weak, slappy, over the top motion. They hang back on the right foot, making them look flat-footed. Placing the ball too far forward in your stance is a much rarer fault, but can be just as destructive. This causes excessive secondary axis tilt (see later articles), which again affects the path and plane of the swing. It also places undue stress on the spine throughout the swing. This excessive tilt would, if you swing properly, cause you to hit the ground before the ball. You will subconsciously compensate for this by sliding your left hip more towards the target, placing enormous stress on your left hip and knee through impact. This slide, as we’ve mentioned before, will result in significant power loss as the lateral movement destroys the tightly centred rotational movement that we desire. It also stops us using the ground for leverage in order to generate power and stability. Again, the result is often a weak, armsy slap at the ball. Next up: Golf Swing 102c – Setup: The Perfect Golf Weight Distribution and Balance.